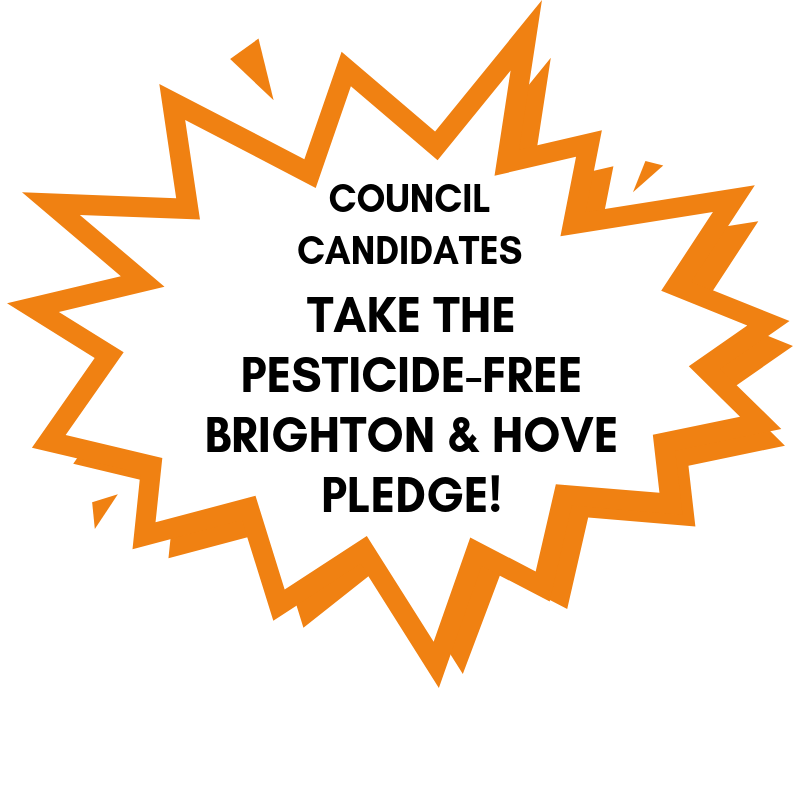 Let’s make Brighton & Hove pesticide-free! At last count, 38 different toxic pesticides were being used in UK towns and cities. They are sprayed in parks, playgrounds, allotments and other green spaces, road verges, pavements and around shopping centres and schools. The chemicals being used have been linked to an array of health problems including cancer, diabetes and neurological disorders such as Parkinson’s. Vulnerable groups such as children, pregnant women and the elderly are most at risk. Pesticides are also having devastating effects on the natural environment. Due to habitat loss and the large quantities of pesticides used in UK agriculture, wildlife such as bees, birds and hedgehogs are increasingly seeking refuge in our towns and cities. However, the overuse of pesticides is destroying many of the areas where they can forage for food and contaminating the natural resources they depend upon. But urban pesticide use is unnecessary. There are lots of non-chemical alternatives available and hundreds of towns and cities around the world have already banned pesticides. Read more about some of the many towns and cities that have already gone pesticide-free here and here. Brighton & Hove Council has the power to ban pesticides on all public land under its control. A number of councils around the UK are already proving that it can be done, including nearby Lewes, which has ended the use of pesticides in all of its public parks and green spaces. In March 2016, Brighton & Hove Council unanimously adopted a Motion promising to phase out the use of glyphosate and seek non-chemical alternatives. Sadly, these promises have not been kept and for the last three years Brighton & Hove has continued to use pesticides. It is time that Brighton & Hove Council finally fulfils the promises made in 2016. With your help, we can make our city pesticide-free. 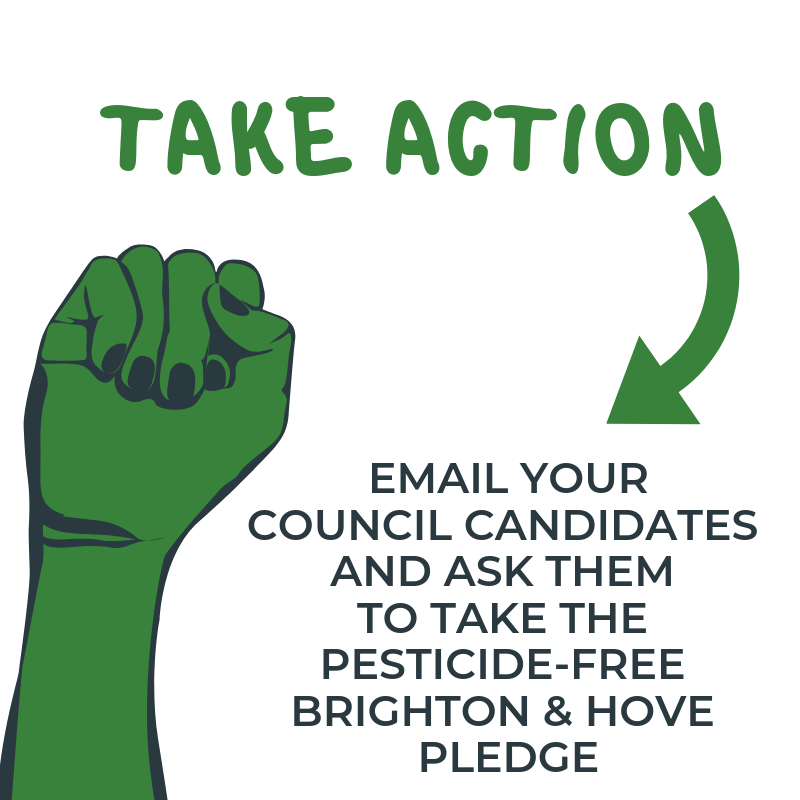 In the run up to the city-wide council elections on 2nd May 2019, PAN UK is asking all candidates to take the Pesticide-Free Pledge. Going pesticide-free is not a party political issue and the Pledge is open for all candidates to sign. 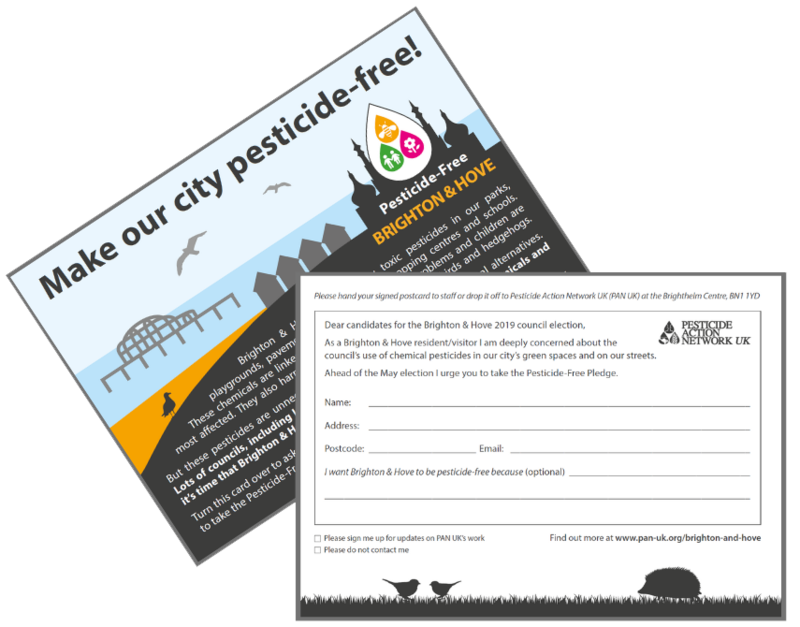 Email candidates standing for election and ask them to take the Pesticide-Free Brighton & Hove pledge. Look out for one of our postcards around town, sign it and hand it in where you found it, or return it to us here at the Brighthelm Centre. If you are a candidate, contact PAN UK and take the Pesticide-Free Pledge. Tell your friends and family about the campaign and share it on social media. 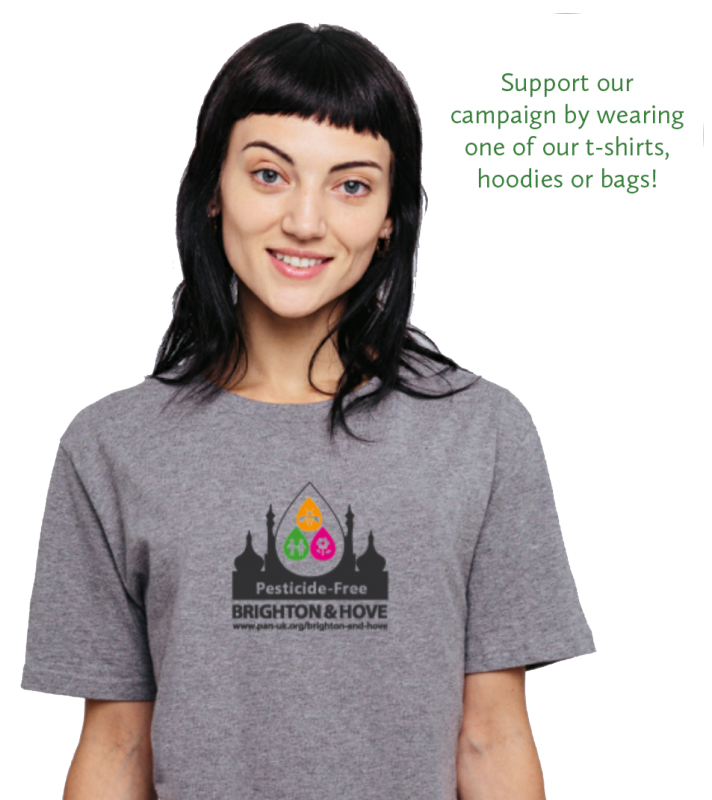 Shop online and buy a Pesticide-Free Brighton & Hove t-shirt, baseball top, hoodie or bag to publicise your support for the campaign. There are plenty of opportunities to get more involved with the campaign. To find out how please contact PAN UK. Together we can get toxic pesticides out of Brighton & Hove’s public spaces and secure a healthier future for both people and the environment. Number of local residents who have already signed in support! Who’s pledged in your ward?